comment A multi-day ticket with the added bonus of a Magic Morning! Special Offer : For park entry 07Jan - 13Apr and 23 Apr - 23 May 2019, prices are currently discounted. 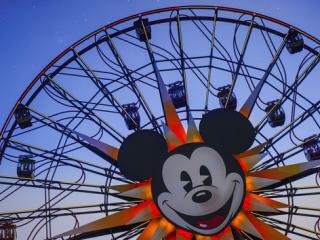 3 days admission to both Disneyland Park and Disney's California Adventure Park. Real e-tickets not a voucher, ensuring minimum fuss when you arrive at Disneyland Resort California. There is nothing to redeem and you simply go straight through the gate on arrival. Ticket is valid for 3 days within a 13 day period, meaning you do not have to use the 3 Day Disney California 1 Park Per Day Ticket over consecutive days. Your 3 Day Disneyland California 1 Park Per Day Ticket gives you entrance to both Disneyland California theme parks - Disney's California Adventure Park and Disneyland Park. Additionally, the 3 Day Disneyland California 1 Park per Day Ticket is valid for a 13 day period which means you do not have to visit Disneyland California over consecutive days. Tickets are activated the first time they are used and expire after 13 days even if you have not used all your days. Special Offer : For park entry 07th January to 13th April and 23rd April to 23rd May 2019, prices are currently discounted. The tickets have the same validity (ie 3 days within a 13 day period) but they expire after 13 days or on/before 23rd May, whichever falls first, and CANNOT be used for park entry 14-22 April 2019. You will be sent a gate-ready Disneyland California 1 Park Per Day Ticket not a voucher, ensuring minimum fuss when you arrive at Disneyland Resort California. There is nothing to redeem and you simply go straight through the gate on arrival. Please note - if you are not travelling in the next 72 hours then it can take up to 7 days for your e-tickets to be updated. Your Disneyland California Park 1 Park Per Day Ticket is valid for 3 days within a 13 day period - you do not need to visit the park over consecutive days.